It had to be called genetic fractals after a scientific discovery I had made a few years before and that no one knew existed. (I wonder how many of those go to graves?). As an ex-magazine writer and lifelong notebook scribbler, blogging was a bit like breathing; thank goodness. A year later, I count the equivalent of 200 pages of deepish thought and commentary on zen philosophy, science, nature , a bit of travel and genetic fractals. I absolutely loved every minute of blogging but I loved nothing more than the exchanges in comments to my posts. What started of as verbal likes quickly turned into lively discussions and exploration. And through these digital chats, I came to know some great people. My last year at work I spent my days alone in an office for 30. I talked to walls and at some point they started talking back. But now, with my blog friends, I was with people again. Real people. Real interesting people. We all have our motivations and reasons for blogging and behind it we have lives. Some of my blogging buddies moved on and a minor crisis involving online harassment didn’t help to keep things going. In my real world I tried to find work again. At 51 I am super skilled, very expensive and not so much needed, it seems. Still, I did lots of networking and picked up a few professional engagements. Late in 2013 I figured it was time to reinvent myself. I had a hard look at my invention and decided that if it was any good, I should be able to turn it into a business. I connected dots from genetic fractals to 3D printing and turned my attention from blogging to innovation and building a business. I don’t know if it will work out but I’m loving it. And who knows, perhaps I’ll sell the business to Facebook for 16 Billion in a few years! One year on, I still post every few weeks and am delighted to stay in touch with some of the bloggers I’ve come to like as friends. I am also about to sign a short term consulting contract that looks like it is the start of something bigger. So, like most entrepreneurs, I will have to continue to work on my start-up in my spare time. On that note, this is just the first anniversary. My grattitude and love to all those great bloggers who have spent time here and in particular those that talk back. Have to say, yours is one of the most interesting blogs i’ve found…. and you’re a good person, which helps enjoy it even more. Good luck with the new contract, hope the roots take hold, and even though i don’t fully understand your new venture, I wish you all the luck in the world. 3D printing is truly going to change this world, so getting in with it can’t go wrong. Thanks John – the sentiments are reciprical. If before knowing you I had positive sentiments, high tolerance towards Christians and any lingering questions from my own upbringing, you have perfectly cleared that once and for all! I still have the tolerance and respect, but in a “sorry, guys, I wish I could help you” sort of way. 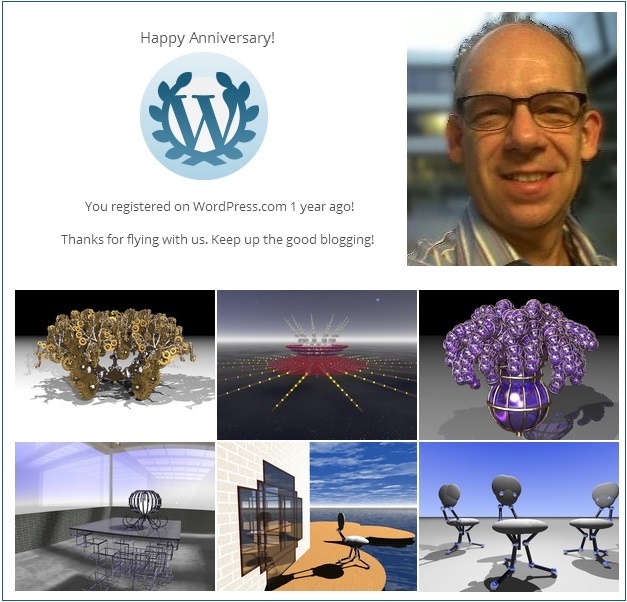 Thanks for making my blogging year fun and for joining my birthday party. Beer now, whisky later!!!! Indeed! keep p with the good work! Congrats! This sounds all very exciting – what a story! Good luck with your ventures! Thanks Elkement, it’s all good fun, as it should be :). Hopefully I’ll be creating some cool blog material. Thanks for the twitter follow!